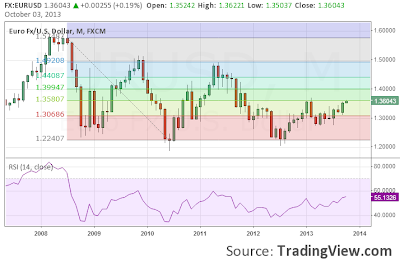 A short term trading opportunity has emerged in the EUR/USD currency pair. Its breakout through the 1.3580 ceiling was a conformation for me that the EUR/USD could be too overbought, if it keeps hovering around that level that is, even when the US markets open. Or does it indicate the beginning of a bullish trend. At this time of writing the pair is a little over 1.36. When I trade the EUR/USD, I generally use my main chart below - it's basically part of my forex Euro / Dollar trading strategy and features the fib retracement levels from after the crash of 2008, because - as you can see - those levels seem very significant in EUR/USD trade (when it breaks through a level it has the tendency to continue that trend or stay in between the lines). A further upswing of the EUR/USD is quite possible if the US government shutdown continues, but bear in mind the economic turmoil that is currently going on in Europe (Italy, Spain and Greece in particular). If there is an bullish trend, the pair could be trading around 1.38 - 1.39 by the end of the year, if there's a bearish trend, the pair will be back to 1.30 levels around the latter mentioned time frame. A 'zoomed in' version of the EUR/USD chart - showing recent trading, the beginning of a bullish trend? Depending how the EUR/USD will react after the US markets open, I still have a bearish outlook when it comes to this pair. As soon as the government shutdown 'panic' blows over, there's a good chance that the Euro will plummet against the US dollar.